So I've dabbled in the whole canning malarky and I have to say it's a bit of a faff! I'm not that patient to sterlise, or boil, or pop the lids. I've made some jams, chutneys, pickled stuff and I have to say, given my slap-dash way of doing things - nothings gone bad, and it lasts just as long as I need it to! 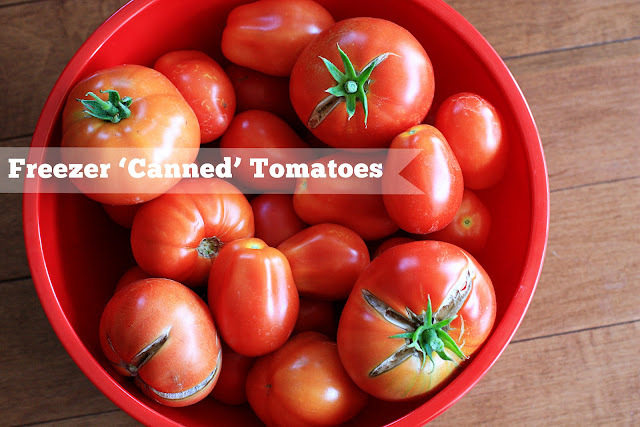 But I do like canned tomatoes. Very much. They seem to go in everything we cook but pretty much all varieties I ever find at the grocery store have additives. At the very least salt. Even the low sodium versions. really? In the summer I do love growing tomatoes - so really canning my own was the way forward. But I do have a chest freezer sitting half empty! So I devised my own little way of 'canning' tomatoes for the freezer (minus the sterlising or boiling bit!) But be warned it's still a messy, juicy job! 1) Peel skins. 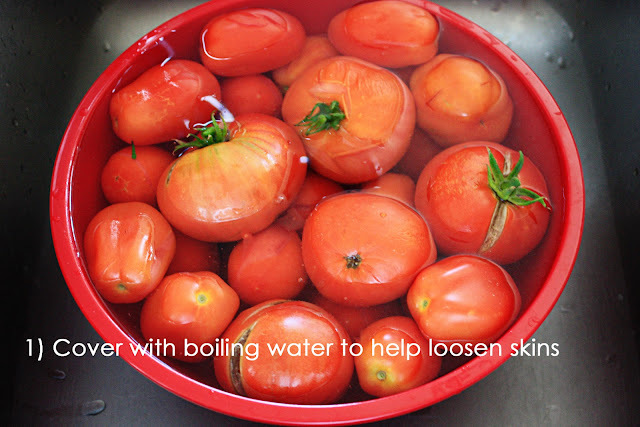 To do this; Prick tomatoes with a knife and cover in boiling water. I actually leave mine sat in the boiling water for up to 5 minutes (this is longer than a lot of canning recipes call for, but because I'm not heating them later when they're in a jar, this is the only opportunity they get for a lil' cooking time!) 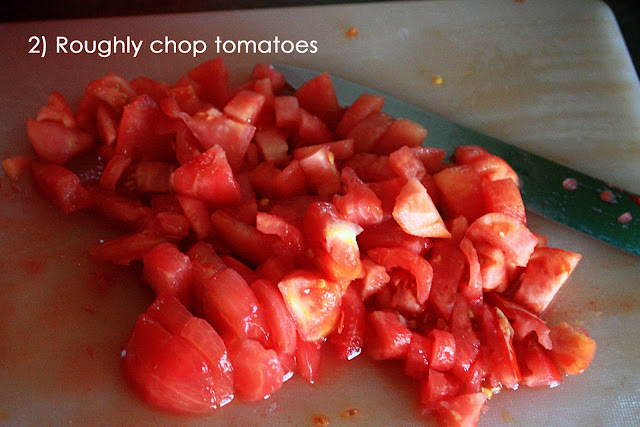 They might go a bit mushy but since I'm chopping them up I don't mind! 5) Use portion sized containers for freezing. I have a couple of perfect sized plastic bowls (same sort of size as a can of shop bought tomatoes). 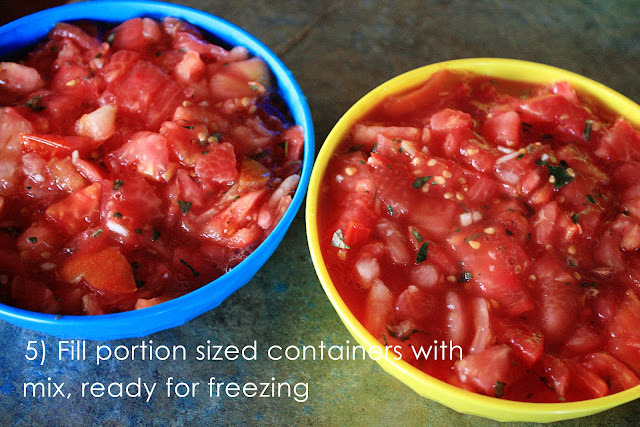 6) I fill a bowl and let freeze overnight. 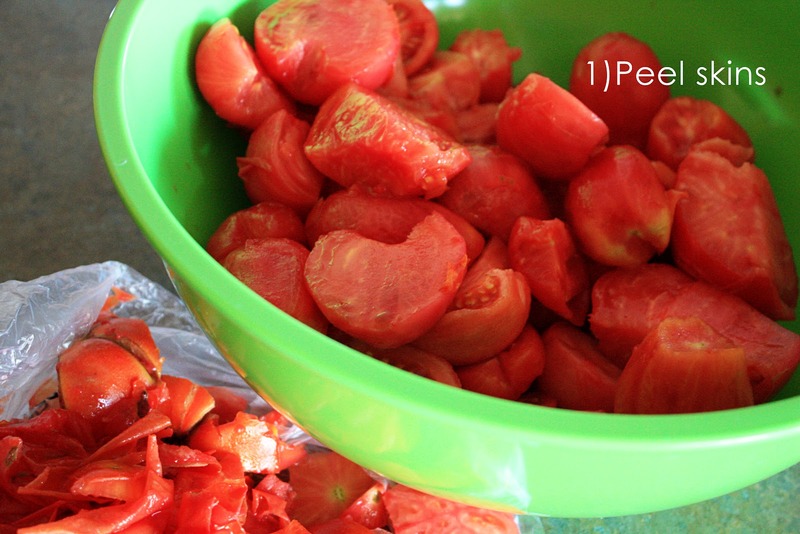 Then pop out the slab of frozen tomatoes and store them in a ziplock bag in the freezer. So far I have the equivalent of 22 cans sat in my freezer and the tomato plants in my garden are still producing. This is great for those end of season stragglers or even some green tomatoes mixed in there - waste not, want not! To use I might put the block of frozen tomatoes on defrost in the microwave for a few minutes but if I'm slow cooking or simmering a dish I'll normally just chuck the frozen slab right in there and let the heat naturally 'melt' them.